Book Review: What Business Should I Start? If you want to start a business but you aren’t sure what business to start, What Business Should I Start? : 7 Steps To Discovering The Ideal Business For You is one of the few books to offer a step-by-step process to evaluate and choose a business to launch. In the 7 step process for decision-making, steps 1 through 3 focus on identifying your Entrepreneur Type (E-Type), clarifying what you want from your business, and exploring how you will integrate your interests and abilities into your business. USA Today put a version of this assessment online so you can take The E-Type Test here to see what you think. Initially, I didn’t agree with my results but then when I thought about them more, they made sense. I’m a hybrid of three different types. Steps 4 and 5 discuss solo entrepreneurship and different business sectors, industries, and specific businesses. Steps 6 and 7 help you to choose your own niche, to rate business opportunities, and to focus in on your top choice. One of the best parts about this book is that small business expert Abrams shatters the myth that successful entrepreneurs are all extroverted visionary risk takers who love to sell, to lead others, and to work nonstop. Many successful entrepreneurs buck this stereotype. Business owners come in many flavors and the key is to build a business that fits your unique personality, strengths, interests, and values. 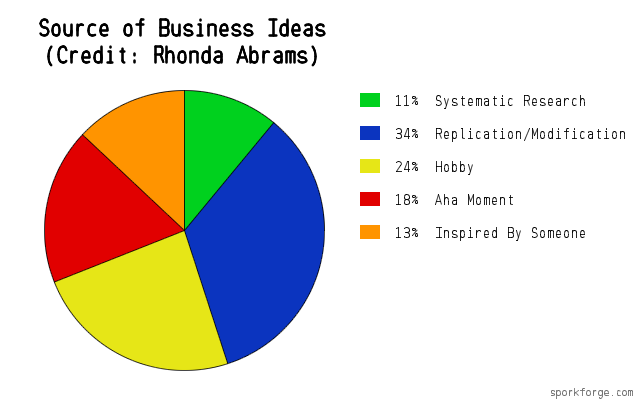 Abrams surveyed her email newsletter subscribers (sign up at her website PlanningShop.com) and found the distribution above of how entrepreneurs decided which business to start. The largest category, “Replication/Modification,” is based on previous work experience where the business owner duplicated or tried to improve an existing business idea. If you combine that with the second largest category, “Hobby,” which means basing a business on the owner’s existing hobby, the survey shows that 58% of the business owners surveyed drew on their own professional and life histories to choose a business idea, while 42% chose something in which they didn’t have previous experience. She also profiles 23 business ideas for the Solo Sustainer category (Animal Groomer, Auto Detailer, Bed and Breakfast, Childcare, Computer Network/System Administrator, Doula, Event Planner, Financial Planner, Florist, Freelance Writer, General Contractor (Residential), Interior Decorator/Designer, Landscaper (Installation/Maintenance), Limo Driver/Operator, Marketing Consultant, Massage Therapist, Nail Salon, Personal Trainer, Private Investigator, Real Estate Agent (Residential), Restaurant, Specialty Foods Manufacturing, and Website Developer/Designer. The business ideas above could also evolve into Balanced Businesses or Visionary Ventures by employing others or scaling them in an innovative way. The final section of the book offers ideas for making a business idea unique by targeting a specific industry or business type, demographic group, geographic area, unique knowledge, or style/product mix. For instance, a bakery could specialize in sugar-free desserts, a childcare business could specialize in caring for twins and triplets, or a freelance writer could niche in the medical industry. 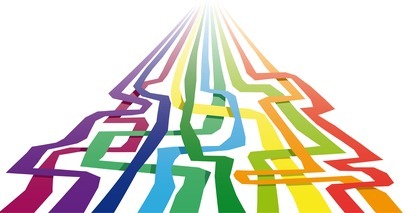 Abrams also gives specific ideas for how to evaluate the soundness of your business idea. I like her suggestion to consult with a Small Business Development Center consultant, especially because doing so is free! I like this book. I hope a digital version is available at some point to make the book accessible to more readers. Did you find this review helpful? If so, please use the buttons below to share it. IMO, an “actualizing activity” that doesn’t have income as a top-level goal isn’t a business!